The Hardest Part Is Getting People To Try It!!!! Babicz Design Ltd. These innovative features are the hallmark of Jeff Babicz Guitars. 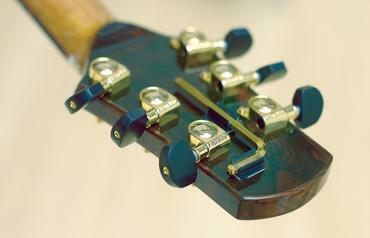 Lateral compression is created by anchoring the strings directly to the guitar soundboard. The stored energy is released acoustically as the guitar is played. 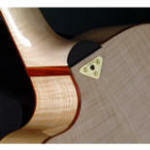 The increased strength inherent in the design allows for a more delicate internal soundboard bracing. The result - unmatched sonic purity. Designed by a musician for the musician. Quick, easy, on-the-fly adjustment of string height without altering scale length or neck pitch. It's so fast, with one turn of the provided key you can go from high "Slide" action to extremely low "Electric" action - seamlessly and without de-tuning! A striking and innovative new design that allows for intonation adjustment throughout the life of the guitar. The icZ bridge is secured to the soundboard through a unique fastener design that allows the bridge to be repositioned at any time. The icZ split bridge drastically reduces forward rotational torque. Bridge saddle height never needs to be altered - volume and tone remain permanently enhanced. When I first took a look at what Jeff Babicz and Jeff Carano were doing….I had my doubts. This was back in early 2004……..they had just done their first NAMM Show with Babicz Guitars. I go way back with these guys. I used to work very closely with Jeff Carano during my days at Steinberger. I always told people he was my boss…..it really pisses him off! But, that’s another story for another time. Working with Jeff Carano, Jeff Babicz, and Ned Steinberger was both fun and educational. I made a lot of contacts when I worked there. Frankly, I would help these guys out even if I didn't like the guitar !!!! In any case, I had a soft spot in my heart for these guys. (That’s right, sometimes a flower can grow through the cracks in the pavement!) They were New Yorkers, and I spent most of my life in Connecticut before settling in Vegas. I knew they got a raw deal from Gibson. After all, these two guys gave their lives to Steinberger--12 hour days, seven days a week. These two guys were handling everything at that company during its most successful period. There was NOTHING they wouldn’t do for that company! Then Gibson buys the company. (But that too is another story for another time.) Anyhow, we all stayed in touch. These guys even flew out to see me on a few occasions….to really demo the guitars in person. But….I still had my doubts. "It looks different!" Now, we all know that I can handle things that are “out of the norm." I was the top Steinberger seller for many, many years….and one look at my website will tell you that I won’t shy away from something that’s “different." I guess I still needed to be convinced. The more I considered the Babicz Guitar, the more I could see that it really, really made sense. With the Babicz design……there is NO WAY for the top to “belly up”--EVER. With the Babicz design and their “Torque Reducing Split Bridge,” you can adjust the intonation…. FOR THE LIFE OF THE GUITAR! But…..what if I can’t sell it????????? Weird is one thing….but functionality is another…..and I can now say for sure…Babicz has NAILED IT! These guitars sound and feel and perform brilliantly. But………what if I can’t sell it?!?! Fast forward to March 2006………………..
Well, that’s all well and good…..BUT CAN I SELL IT? I just got my first SPIDER….and better yet, I’m one of the very first US Dealers to get Babicz’s new OCTANE. Now…THESE I CAN DEFINITELY SELL! The SPIDER is the perfect acoustic/electric……..very cool looking in all black w/ chrome hardware. (These guys still have some Steinberger in their blood.) It sounds just as great playing rock as it does when you’re finger-picking. I can easily say it’s the most versatile acoustic/electric I’ve ever had in my shop….and I’ve had them all! The quality of the SPIDER is impeccable: all solid Mahogany, very well put together, killer sound which comes alive with the included L.R. Baggs Element On Board System. No wonder Todd permanently retired his Takamines….and no wonder K.K.Downing uses these as his exclusive acoustic/electric, either in the studio or on stage. The SPIDER comes with a high quality TKL hard shell case with the most comfortable figure-8 handle I’ve seen. Thankfully, Babicz and Carano learned not to skimp on the extras. The guitar lists at $1195.00. I of course will give you a great discount....All Solid Wood….L.R.Baggs….TKL Case…….under a grand. I can describe the SPIDER in two words…. Put it up against anything else in its price range…its not even a fair fight! This guitar outright ROCKS! Right out of the case (also very nice) this axe is striking….beautiful black top over a stunning Mahogany body, with 2 Pearly Gates that scream if you want them to, or clean up real nice if that’s what you prefer. I will also make the Duncan Black/Backs available to anyone who wants them. I was instantly amazed by the feel….there’s something about the way the string anchors work that make the strings feel very relaxed on the fret board. Players say that with a Babicz, it always feels like you’re using strings one gauge lighter than you actually are. If you’re using 11’s, they feel like 10’s, if you’re using 12’s, they feel like 11’s. The sustain out of this guitar is nothing short of unbelievable. Even when it’s not plugged in….there’s a “feel” you get from the guitar….it friggin’ feels ALIVE. Plug it in, and you are instantly inspired. As with all Babicz guitars….tweak the neck to where it feels just perfect for you…….you just can’t do this on any other guitar. The guys told me it was inspired by Billy Gibbons. The story goes that Billy checked out a SPIDER at one of the ZZ Top shows in Manhattan Kansas. Jeff Carano was there to meet with Keith Urban, who was also on the bill, but then had the chance to hook up with Elwood Francis backstage. (Elwood is Billy’s long time tech and has worked for Billy for many years in helping him put his legendary collection together). So Jeff Babicz went to work on his bench. These guys always wanted the electric version anyway, and Billy’s encouragement was just the motivation they needed. Babicz nailed it……this guy really know guitars, and everything he comes up with has a purpose. Any doubts I had were instantly gone after a few minutes with the Octane. Elwood said that “this guitar becomes part of the player”….that’s the best description I’ve heard yet. When I first started playing guitar, I always wanted something different. I didn’t want to play the same guitars that everybody else played. I guess on some level I knew then that having an identity on the guitar was one of the trickiest things to come by, and a unique instrument would get me one step closer. Over the years, I’ve come to realize that the reason so many players choose the same instruments is because those instruments are awesome, and I’ve added a few tried and true classics to my collection. But I never completely lost that desire to play something unique. That’s part of the reason I wanted to check out the Babicz line of acoustics. I was intrigued by the way the strings splayed out over the guitar’s top, creating a look that was reminiscent of bike spokes or bridge cables. And although that may be the most noticeable feature of these instruments, it’s clear that Babicz has a lot of unique ideas going on. The Jumbo Rosewood Cutaway ($1,895 retail as tested with L.R. Baggs iMix system is part of Babicz’s Identity Series of handcrafted acoustics. Aside from the obvious visual component of the Jumbo Cutaway—the array of strings anchored around the guitar’s lower bout—there are plenty of other cool cosmetic features. The solid spruce soundboard looks sweet. The gloss-finished solid rosewood back and sides are beautifully rich, as is the use of rosewood for the headstock overlay, bridge, and string retainer. The black tuning machines and string anchors bring a rock-and-roll toughness to the Jumbo Cutaway. Structurally, there is a lot going on with this guitar. Let’s look first at the way the it’s strung. Rather than a standard bridge, Babicz guitars employ an “Adjustable Torque Reducing Split Bridge.” The design is meant to address what Jeff Babicz sees as drawbacks to traditional designs. 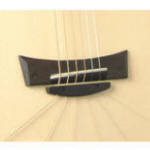 Basically, the strings don’t terminate at the bridge, which is what causes the bellying effect on acoustic tops. Instead, the strings pass over the bridge, through the string retainer (which in turn puts downward pressure on the bridge), and on to the string anchors on the lower bout. Attaching the strings to the top not only looks bitchin’, it also spreads out the string pull to the entire soundboard—not just the center, which is actually the weakest part of the top. This method also allows Babicz to employ much lighter bracing—bracing that can be designed for sonic, rather than structural, considerations. This results in a soundboard that can move more freely for better tonal balance and truer bass response. If that’s not forward-thinking enough for you, there’s the Continually Adjustable Neck. Anyone who has tried to adjust the action on an acoustic knows that it can be a risky, invasive procedure. 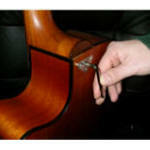 Lowering the saddle changes the tone and resetting the neck can only be done by a skilled pro. What Babicz has done is to give players the ability to change their action on the fly with an ordinary Allen wrench. Not to be confused with the trussrod adjustment (which these guitars also feature), using this Allen wrench at the neck heel moves the neck up and down in relation to the strings. There is no change in neck angle and thus no real change in pitch. It really works. In a matter of seconds, I took the Jumbo Cutaway from a robust strummer to a low-action flat picking shred machine. I took the action so low that it buzzed and then cranked it up high enough to play slide. It’s really amazing and the handy clamp to hold the Allen wrench on the back of the headstock takes me back to my Floyd Rose days—yeah! So enough about all the high-tech stuff—how does this guitar sound? In a word, great. 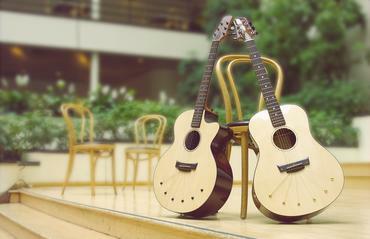 The Jumbo Cutaway has a full, clear voice with excellent balance. It has a present, articulate sound with uncommon clarity from string to string. Maybe because of the neck design or the string arrangement, this guitar has incredible sustain, particularly in the upper register. On the Babicz website, he talks about avoiding the “dreaded fretboard ‘dropoff’” past the neck/body joint and that problem certainly seems to be solved here. The Jumbo Cutaway sports the L.R. Baggs iMix pickup/preamp system, making it a great gigging guitar. In fact, when you plug in, the adjustable neck becomes an even cooler feature. I found that a lower action, when played with a light touch, made for a great amplified acoustic tone that was easy on the hands. But whether you play it as a straight acoustic or plug it in, this guitar rocks. Very cool. The D’esque ($9,995 retail/street N/A) represents Babicz’s high-end Signature Series and they do a great job of presenting this beautiful instrument in the most flattering light. First you have the bomb-proof hardshell case that appears to be covered in faux rhino skin. Open it up and there’s gorgeous purple velvet on the inside that would have made a great coffin for Elvis when he (allegedly) died. There’s a temperature/hygrometer gauge inside to ensure that the D’esque is comfy. The body shape is similar to a dreadnought (which explains the name, as in “dreadnaught-esque”) but with a narrower waist, smaller upper bout, and a rounded lower bout. Visually speaking, this guitar is simply stunning. Everything about it is top-notch, from the German spruce top (with a nitrocellulose, high-gloss lacquer finish) to the figured Brazilian rosewood back, sides, and headstock veneer to the one-piece Honduran mahogany neck, this is one of the sweetest looking acoustics I’ve ever seen. The tortoiseshell binding is luscious and the abalone inlay is very classy. 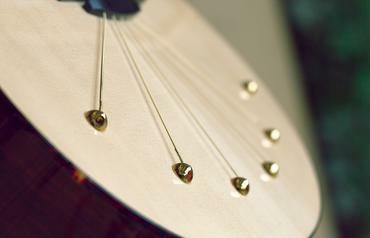 The gold Grover locking tuners (with ebony buttons) reinforce the notion that this is a serious, high-end instrument. The D’esque is sonically beautiful as well. It’s loud and full and has a very present quality, helped out by the awesome side port that serves as your own personal monitor. Compared to the Identity, I hear more highs, more lows, and more volume out of the D’esque. It’s inspiring to play, with a clear, distinct voice that works great for finger-picking or strumming. A term some testers used was “modern” to describe the D’esque’s timbres, and that seems fitting. Certain passages have a clarity on this guitar that I had a hard time matching on other acoustics—almost like a 6-string high-definition TV. I once again had a blast raising and lowering the neck on the D’esque and I discovered another cool thing: Babicz’s Continually Adjustable Neck System makes it much easier to use more extreme tunings, both above and below standard pitch. For instance, dropping most acoustics down to DADGAD or below (say, to open C) typically necessitates using heavier strings to avoid the rattling and buzzing caused by the decreased string tension. Not with this guitar. I took out the trusty Allen wrench and simply raised the D’esque’s action until the rattles went away. It took about five seconds. Conversely, I found that higher tunings, such as open e and eBeABe (DADGAD up a full step)—unadvisable if not impossible on most acoustics—were actually manageable on the D’esque because I could lower the action. Unless you’ve tried a D’esque, it’s fair to say that you’ve never played anything like this. It’s not cheap, but it is in line with many handcrafted, top-of-the-line acoustics. This guitar would be perfect for players—admittedly well-heeled players—who don’t want what an old-school acoustic offers. Or, more likely, the D’esque will appeal to players who already have some benchmark acoustics in their collection and want to add a future classic.